A protest has been held to show opposition to the development of land associated with the Battle of Culloden. About 40 demonstrators walked half a mile from the battlefield to Viewhill Farm where 16 homes are to be built. Government army lines in the battle involving forces loyal to Bonnie Prince Charlie are believed to have extended to the farm. A spokesman for Inverness Properties, which had led on the development, said the battlefield would not be affected. 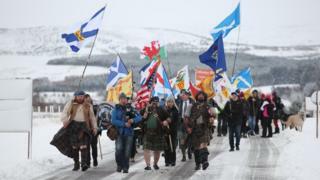 Group to Stop the Development at Culloden (GSDC) organised Saturday's march near Inverness. The battle's fighting took place over a wider area than the parts of the battlefield that are in the care of the National Trust for Scotland, which opposed the plans for houses at Viewhill. GSDC and other organisations, including The 1745 Association, have concerns about the loss of the wider battlefield to development. Inverness Properties secured planning permission in 2014 for 16 homes at Viewhill. The site has now been taken over by Aberdeenshire-based Kirkwood Homes. A spokesman for Inverness Properties said there were misunderstandings about the impact the new development would have. He said: "The facts are that there are arguably at least 40 homes closer to Culloden Battlefield, which cannot be seen from our location. "This development will account for only six acres of the farm, with 184 acres continuing as farmland. "The farm buildings which we have demolished were considerably higher than the houses in the proposed development, which will be of one and a half storeys in height - less than half the height of the farm buildings." Highland councillors had refused Inverness Properties planning permission. But, following an appeal by the developer, a Scottish government-appointed planning official granted permission with conditions in January 2014. The reporter agreed with Historic Scotland that it was unlikely that the proposal would have "any impact on the character and ambience of the battlefield". Fought on 16 April 1746 near Inverness, Prince Charles Edward Stuart and his Jacobite force were defeated at Culloden by a government army led by the Duke of Cumberland.